Every now and then, we are privileged to be present when a previously unknown piece of Hatteras Island’s history is revealed. This is one of those special moments in time. After nearly two years of exhaustive investigation, a local historical researcher, Mel Covey, has been able to identify the location of Old Indian Town. Indian Town was the principal village of the Hatteras Indians when the first English settlers arrived on Roanoke Island at the end of the 16th century. While there were Indian settlements throughout what was then known as Croatoan, Indian Town was the main center of activity and population for its inhabitants. 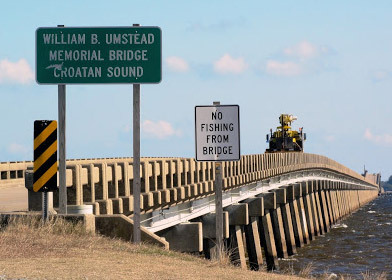 In contrast to the current configuration of the island, there was an inlet just north of present-day Buxton called the Chacandepeco Inlet, and Hatteras Inlet as we know it did not exist until 1846. On the surface, you would think that identifying Indian Town would be a fairly simple task since in 1759 there was a land patent of 200 acres to “William Elks and the rest of the Hatteras Indians … including the old Indian Town”. A land patent was a royal grant from the King of England that was administered by the governor of the local area. While the patent contained metes and bounds entries of the property’s boundaries, the practice at the time was to use natural landmarks such as the description – “beginning at a forked live oak stump at the East End of the Town running N 33° W 16 poles to a stake on the Sound Side then along the Sound Side 150 poles to the Mouth of Kings Creek…” You can imagine the difficulty of locating these points 259 years later considering our dynamic barrier island environment, erosion, and shifting sand, not to mention the effort required to read and to interpret a large number of documents that were handwritten in old English. No formal survey of the Indian land patent has yet surfaced. Mel Covey solved this challenge much the way we might complete a jigsaw puzzle with a missing piece. He located adjacent land patents, surveys, etc. that contained references to Indian Town or similar phrases. Then, using a succession of maps and charts, he was able to reconcile and overlay original property boundaries on current county tax maps. The result of this in-depth, focused research was to identify the location of Indian Town as being in the present-day village of Frisco. Mr. Covey has chosen not to disclose the exact location within Frisco at this time, because most of the Indian Town site is situated on private property with over a dozen owners, and permissions have not been obtained to research the area in more detail. 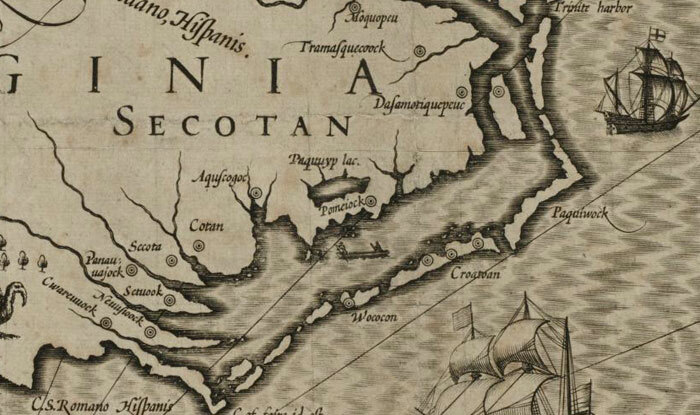 The principal objective of the Covey investigation was “to discern the original metes and bounds of the Hatteras Indian Patent, and, thus, greatly expedite the search for Croatoan’s Old Indian Town.” The mission was purely exploration and discovery leaving conclusions for academics and others to discuss, interpret, and debate. His work did not address history, archaeology, geology, or literature. Mr. Covey envisions his research findings as a launching point for further investigations of the main village of the Hatteras Indians and possible identification of any links to the first English colonists. Most of the archaeological work on Hatteras Island up to this point has been focused along the Cape Creek area in Buxton. With the location of Indian Town now determined, new opportunities for future exploration may offer the potential for finding fresh clues to solving one of our country’s greatest mysteries. When published, his manuscript contains a detailed description of his methodology so that subsequent researchers can duplicate or critique the analytical process that he used. The results of his efforts will be offered for peer review and to interested individuals to facilitate the advancement of the first natives’ perspectives and their legacy. As often occurs with comprehensive original research, the investigative process produces unexpected benefits. In the case of the search for old Indian Town, an understanding of the genesis of many island family names was expanded, and the scope of the relatively unknown colonial plantation era on Hatteras Island, including the windmills, was extended. We can all applaud Mel Covey for the breadth and the depth of his contribution to understanding a long-forgotten chapter in our island’s history.